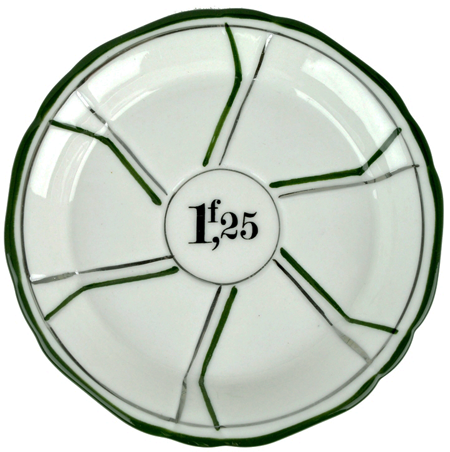 Gorgeous replica of the Bistro Saucer or 'Sous Verre' used in French bistros and cafes. The saucer was marked with the price of the absinthe. At the end of the evening, the prices on all of your saucers was totaled to calculate your tab. Hand painted green rim and green and silver lines, this quality ceramic saucer is 4 & 5/8 across and will fit glasses with up to a 3 & 1/8 base. Delicately serrated edge. See all saucer colors.